FOI is one of Europe’s leading research institutes in the defence and security area. The agency is financed on contracts’ basis and is responsible to the Swedish Ministry of Defence. The core business is research, method and technology development and studies. It was created in 2001 through the merger of the then existing governmental agencies FOA (National Defence Research Establishment) and FFA (Aeronautical Research Institute). The organisation employs approximately 1000 personnel of whom about 800 are scientists. This makes FOI Sweden’s largest research institute. The Asia Security Studies Programme at FOI conducts research and policy-relevant analysis on defence and security related issues in Asia with national, regional and global implications. 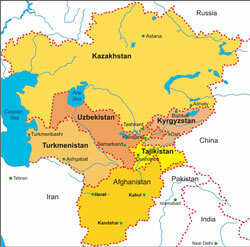 The primary focus of the programme is on East and South Asia, as well as the Persian Gulf region. A number of experts at FOI work directly with the Programme, while other researchers are affiliated and collaborate on a temporary basis. The Programme cooperates with other research institutes in Sweden and abroad on a regular basis. More information about ongoing projects. FOI researchers involved in South Asia related research projects include the Analyst Magnus Normark, working within the Division of Defence Analysis. He is a specialist in non- and counter proliferation and disarmament. His research includes threat assessment of weapons of mass destruction and terrorism. One of his his publications is entitled ”Northern Afghanistan – environmental and health hazards to personnel to be deployed to Northern Afghanistan”. More information. Dr. Magnus Norell is working as senior researcher at FOI, mostly working on issues dealing with terrorism and radicalization. His area of research includes the Middle East and Pakistan, but also East Africa includng the Horn of Africa. In 2010, Magnus Norell has published a FOI Report entitled ”Militancy in Pakistans federally Administered Tribal Areas (FATA) and Afghanistan”. It tries to identify militant organizations operating within the Federally Administered Tribal Areas, and provide some more detailed profiling and the identification of their supporters in the rest of Pakistan. This report also shows the scope of the support that the militants – on both sides of the Durand-line – receive from Pakistan. Inaddition, the report shows how interconnected the security situation in Pakistan is with the low-intensity war in Afghanistan. Go for the full report. Emma Sandström is a political scientist, in her research focusing on Central Asia. In 2002, she write a FOI Report entitled ”Afghanistan and Central Asia after September 11 – The Security-Political Development. Read the report. Kristina Zetterlund is another Analyst at the Division of Defence Analysis involved in research on Pakistan, Afghanistan and Iran. In January 2009 her report ”Pakistan – Consequences of Deteriorating Security in Afghanistan” was published. In order to highlight the regional linkages the writers has analysed different topics with a deteriorating security situation in Afghanistan as point of departure. The objective of the report was to look at developments in Pakistan from a domestic, regional and international perspective. Read the full report. Abstract: After eight years of war the Taliban movement, inferior in numbers and resources, seems successful. One of the reasons stated is that the Taliban are good at winning the hearts and minds of the Afghans. They are assumed to be skilful in propaganda and information operations. The International Security Assistance Force, with the task to support the Afghan government is assumed to be less competent in the battle of hearts and minds. This report summarises our current knowledge of the insurgency in Afghanistan in regard to the struggle for hearts and minds. In particular strategies for counterinsurgency, COIN, are in focus. In this struggle the propaganda war is at the centre. The information activities of the Taliban in comparison the ISAF psyops is discussed. The conclusions are that the hearts and minds should first and foremost be seen as a matter of cooperation. The success of the Taliban rests with their ability to gain support among rural villages. Villagers choose to cooperate with the Taliban as a result of rational deliberation in regard to what they believe is in their long term interest. The lack of law and order is the main concern for most Afghans and many villages see the Taliban as a better guarantor of security than the central government and ISAF. In addition the report concludes that the skilfulness of the Taliban as propagandists probably is exaggerated, but that their information activities have a fixed purpose. For insurgents information activities are important and the Taliban act accordingly. For ISAF the situation is the opposite. Pysops activities have low priority. 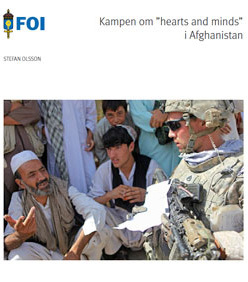 The report ends with concluding that for Swedish concerns more studies on counterinsurgency, COIN, are needed, and that the capacity for conducting information operations in terms of influencing opinions is strengthened. In September 2008, FOI organised a conference in Stockholm entitled “Pakistan – Consequences of Deteriorating Security in Afghanistan”The keynote speakers included Dr. Stephen Cohen (author of ”Four Crises and a Peace Process, 2007), Shuja Nawaz (author of ”Crossed Swords: Pakistan, its Army and the Wars Within”, 2008) and others. Several speakers at the conference drew attention to a recent report by the Pakistan Policy Working Group entitled ”The Next Chapter: The United States and Pakistan”. The report suggested a new Pakistan policy for the incoming administration in the United States. The September 2008 conference was a follow-up on a previous workshop organised by FOI in April the same year, where participants were invited from different Swedish universities, research institutes and government departments. These events formed part of the research programme on Asian Security, as mentioned above. Over the years, FOI has also organised a number of seminars focusing on South Asia. In September 2004, the Pakistani Brigadier (Ret.) Feroz Hassan Khan participated in a seminar organised in collaboration with the Centre for Pacific Asian Studies at Stockholm University. Khan was at the time Visiting Scholar at the Naval Post-Graduate School, Monterey, California, USA, and he lectured on ”Confidence Building Measures in India-Pakistan”. Previously Khan was Director, Arms Control & Disarmament Affairs (ACDA), Strategic Plans Divisions, Joint Services Headquarters in Pakistan.